Capsule is your online personal stylist, delivering monthly customized shopping lists straight to your inbox. Stylecab is a style hub. We provide stylists to edit fashion’s myriad of choices through a range of styling services from wardrobe reviews to personal shopping experiences. We curate looks, identify niche brands and translate trends. Our network of stylists are based in London, Paris, New York, HK, Shanghai, Beijing and Sydney. 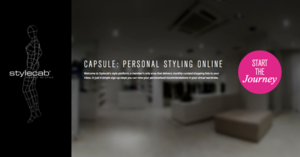 Capsule our style recommedendations platform delivers personalised shopping lists straight to a subscribers inbox. Currently in beta phase, we will be launching in the 3rd quarter of 2014.